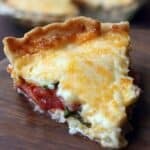 Garden Vegetable Pie is packed with tomatoes, zucchini, yellow squash and onion, and layered with a delicious cheese spread. Growing up my grandma and grandpa had the most amazing garden. Every vegetable you can imagine, and most fruits too. It wasn’t until my grandpa passed away that I realized how much I took it for granted. I enjoyed fresh garden tomatoes all summer long and we had an endless supply of raspberries to make homemade raspberry jam. And we had enough zucchini and yellow squash for a small army. Place the tomatoes in a colander in the sink in 1 layer. Sprinkle with salt and allow to drain for 10 minutes. Heat a large skillet over medium-high heat. Season zucchini and squash with salt and pepper. .
Layer the tomato slices, zucchini, squash, and onion on the bottom of the pie shell. Sprinkle basil on top. Smooth cheese mixture over the top and sprinkle parmesan cheese on top. Bake for about 30 minutes or until lightly browned. Allow to cool for at least 10 minutes. Soo…. I think I am going to start a garden next year just so i have a constant excuse to make this! This pie was incredibly delicious!! Will be making again! Thank you for the great recipe! I made this followed the directions exactly, but mine was soggy :(. I salted the tomatoes and patted dry. I did add other veggies like red peppers and fresh spinach. I cooked it as the directed, but the onions were under done, still crunchy. next time I will cook the onion before adding and maybe decrease the tomato. it was good though. I made this pie today. I added chicken, roasted red peppers, and sweet potatoe. The bottom was very soggy but it came out VERY good! Great Recipe! This was a big hit!! I didn’t have any problems with sogginess at all. Maybe others aren’t pre-cooking their crust? I baked mine until it was golden brown then let it cool completely before adding the veggies (I think letting it cool really helped). I also patted all the veggies with paper towels to get out as much water as I could. I mixed in the basil with the cheese mixture and it worked great! Delicious. I’m wondering if brushing an egg wash on the crust before pre baking would eliminate the risk of sogginess… I’m planning on making this for my mom’s birthday. Possibly serving a pasta salad on the side. Thoughts? This was AMAZING! Was loved by all, kids and adults! I added a little oregano and mixed the basil into the cheese mixture! Will definitely make again! Thanks! Thanks so much for sharing! Happy everyone loved it!! 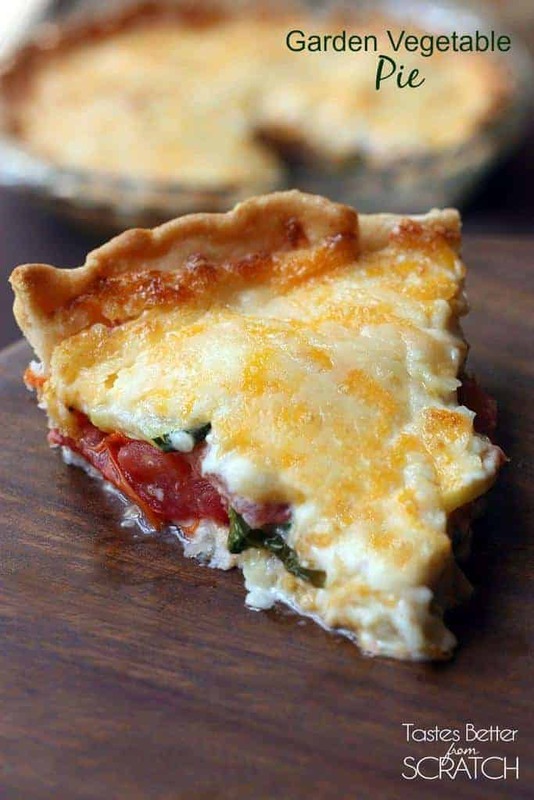 I love tomato pie, and I absolutely love how you added zucchini and squash to it! What an awesome idea! Thanks for sharing this! I wonder if this would work well with sun dried tomatoes? Might soak up some of the soggy? I dry many of my own veggies so it peaked my interest.